Bánh Mì, how I crave thee. 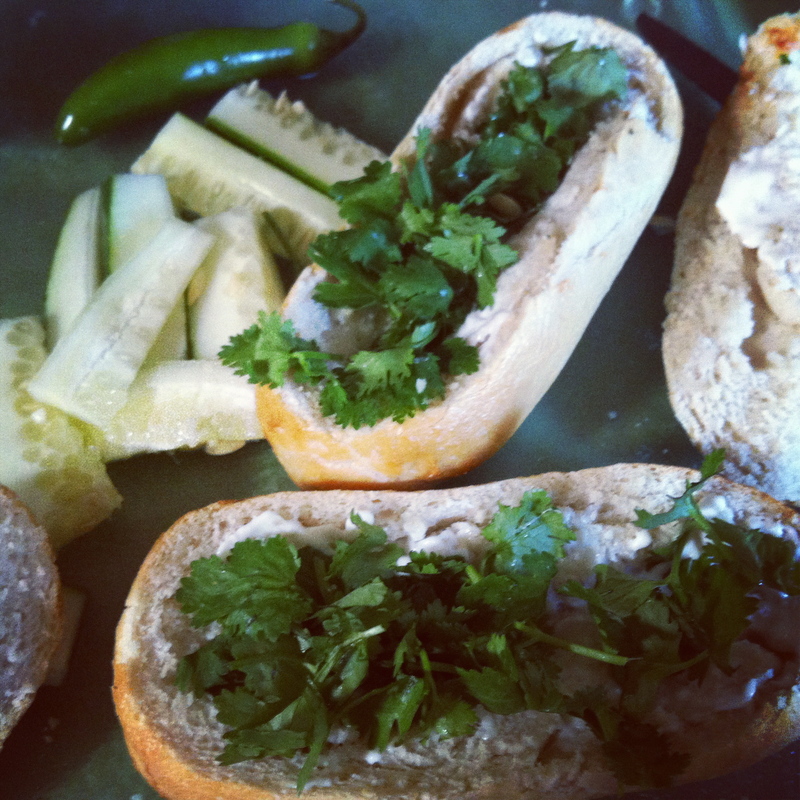 Bánh Mì s a baguette sandwich that exemplifies the fusion of Vietnamese and French cuisine. Merci, colonialism. French ingredients include crusty baguette and mayonnaise, while the Vietnamese ingredients include cilantro, cucumber, shredded carrots and daikon radish. And heat! Lots of heat from hot peppers. Many forms of protein can be used: paté, pork, eggs, tofu, and seitan are all traditional (at least according to Wikipedia). 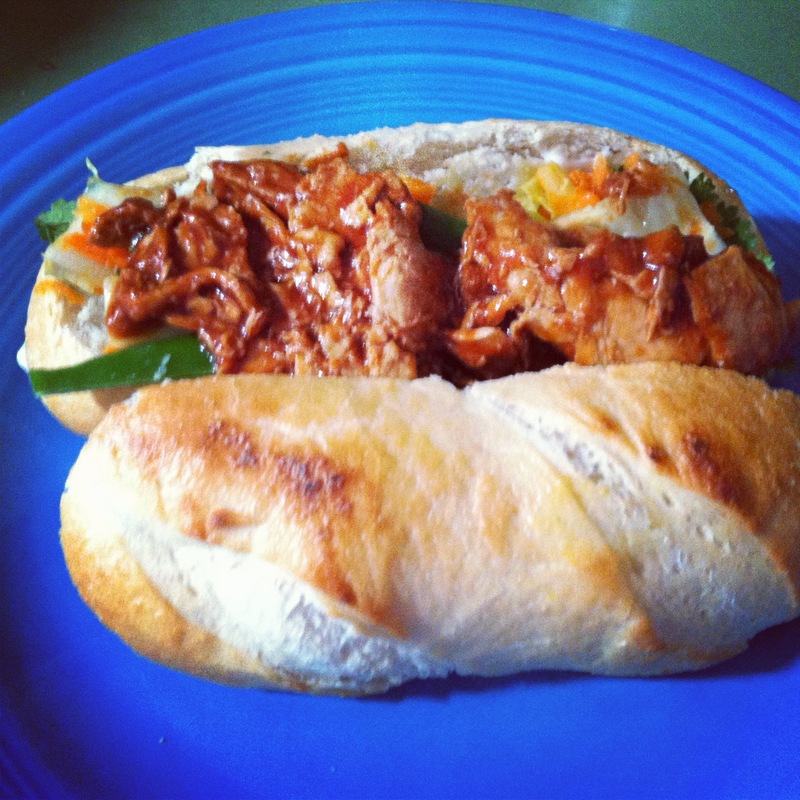 Vegan Bánh Mì Recipe for Two…or one really hungry you. vegan protein of your choice: tofu, seitan, tempeh or faux meat, plain or marinated. 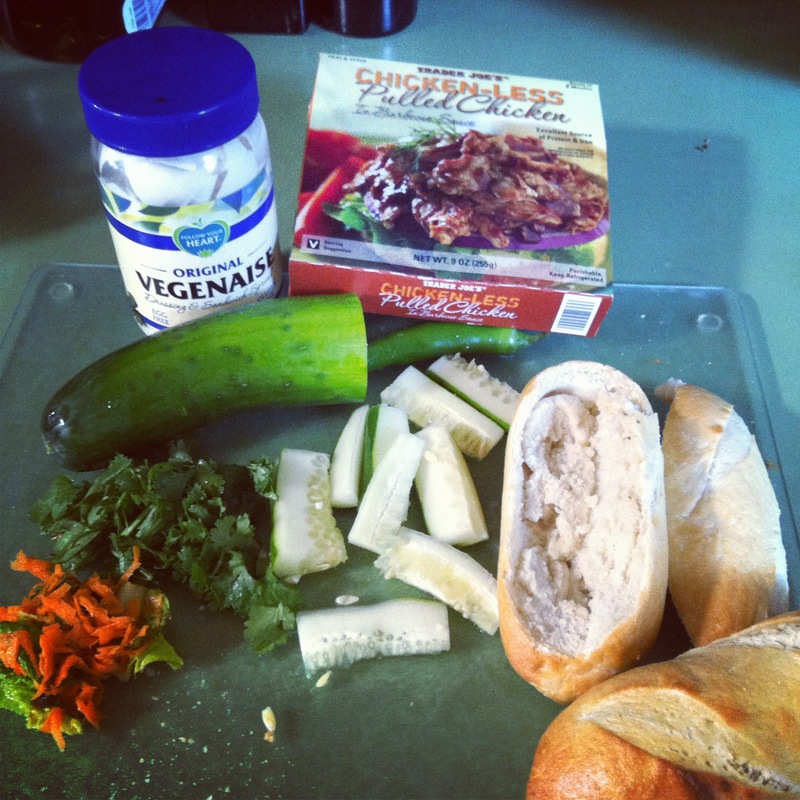 I used “Chickenless Pulled Chicken” from Trader Joe’s. Coat both sides of bread with Vegenaise or avocado. Ahhhh, Banh Mi. You are mine, all mine. Place the top of the baguette, well, on top. Hold it tight. Squeeze it together–things could get messy! Start thinking about the next time you can make this. I was *just* thinking about Bánh Mì. There’s a facebook event, “Worldwide Vegan Taco Day”, on August 4 and someone mentioned making this in a taco. I’d never heard of Bánh Mì, but I think I’ll try this! Now, a vegan banh mi taco would be truly post-modern! Haha – I think I can pull it off!! Vegan since 1992 and author of two vegan cokboooks,Dining With Friends: The Art of North American Vegan Cuisine, and The Best of Vegan Cooking, which was released in March 2009. Both books published by Friends of Animals’ Nectar Bat Press.Count me in, too. Omg that looks amazing, I need to try it!